We also treat relationship break-ups, anger, post-traumatic stress disorder, loss and grief, and many other problems. A different version of this article was published in the Journal of Psychiatry and Law. Panic is similar to anxiety in that both include muscle tension, rapid heartbeat, sweating, dizziness, and G.I. distress. But unlike anxiety, panic also includes difficulty breathing — the feeling that you can't get enough air — often leading to hyperventilation. And unlike anxiety, panic includes the fear that you are having a heart attack or going crazy, or losing control. In addition, anxiety is more or less chronic, while panic is episodic. Panic attacks come on suddenly and often unpredictably, although panic attacks are more likely to occur in certain situations, such as large, crowded stores, traffic jams, unfamiliar places, and when the patient is a distance from home. CBT is effective for 80% of panic patients. Cognitive-behavior therapy (CBT) for panic attacks has the highest success rate of any treatment for any psychological disorder. Research evaluating packages of CBT techniques commonly find a success rate of about 80%, and good maintenance of that success after treatment (Craske & Barlow in Barlow, Ed. Clinical Handbook of Psychological Disorders, Guilford, 2008). 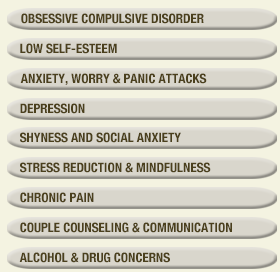 These CBT treatment packages typically include many interventions which are used with every patient in the study. In real life, however, some patients improve rapidly with a few techniques, while other patients improve very slowly over a long period of time. And some patients respond well to certain techniques, while other patients respond to different techniques. So which techniques should be used with which panic attack patients? 1. Cognitive Interventions: Panic attacks are not dangerous. The most important cause of panic attacks is the fear of panic attacks. In order to overcome panic attacks, patients must overcome their fear of panic attacks. Panic patients often believe that their symptoms mean that they are having a heart attack or going crazy or losing control. Tell these patients that panic symptoms are neither dangerous nor a sign of cardiovascular problems. Most panic patients also believe that they cannot tolerate their panic symptoms. This is incorrect. Panic attacks are uncomfortable, even frightening, but patients can learn to tolerate their panic attacks. The most important cause of panic attacks is the fear of panic attacks. Information and logical arguments that panic attacks are not dangerous will diminish some patients' fear of panic attacks, but oppositional or resistant patients may rebel at direct attempts to change their thinking about panic attacks. With these patients, "Socratic questioning" is usually more effective than logical arguments. Socratic questioning means asking patients questions which will sow doubt that their panic symptoms are dangerous or intolerable. For example, ask oppositional patients for specifics about the dangers they fear: "What is your the worst fear?" "What if that happened?" "What is the probability of that happening?" "What if you had those feelings?" "What if you fainted?" Logical explanations and Socratic questioning are much less powerful than personal experience. In order to cure panic attacks, almost all patients must learn by personal experience that they have nothing to fear from their panic symptoms. And to do this, patients must expose themselves to their panic symptoms and to the situations that provoke these symptoms. A. The more patients avoid situations that may provoke their panic attacks, the more fearful they become. B. The more fearful they become, the worse their panic attacks become. C. The worse their panic attacks, the more they avoid situations that might evoke their panic attacks. is to do the thing you are afraid of." Begin with easier exposures and gradually move on to more anxiety-provoking exposures. Ask patients to design their own program, and let patients set their own pace. Many patients are resistant to doing exposure exercises, so you may have to be both patient and creative when implementing in vivo exposure. In order to overcome their fear of panic attacks, patients should do whatever they are afraid of. They should seek out and welcome situations that evoke their panic symptoms because these situations provide the best opportunity to overcome their panic attacks. When they experience a panic attack, patients should do whatever they would have done if they were not having the panic attack. If they cannot do this, they should sit down and wait passively for their panic symptoms to subside. Patients should do nothing to avoid, escape, or reduce their panic symptoms. If this would be dangerous, such as when patients are driving, they should pull over, park, wait for their panic symptoms to subside, and then continue driving to their original destination. Exposure means facing not only previously avoided places, but also previously avoided activities such as drinking coffee and aerobic exercise. It is important that exposure be frequent and prolonged. Short, occasional exposures are often ineffective. Ideally, patients should remain in symptom-provoking situations until their symptoms diminish significantly. But anxiety symptoms can diminish between exposure exercises, even if they do not diminish during exposure exercises. wait passively for their symptoms to subside. Many patients find it helpful to view their panic as an external enemy that is trying to control them. If the panic prevents them from doing what they want to do, the panic wins and becomes stronger. If the panic does not prevent patients from doing what they want to do, the patients win and the panic becomes weaker. Safety behaviors are anything patients do to avoid, escape, or reduce their panic symptoms. Patients should refrain from performing any safety behaviors during exposure exercises. Common safety behaviors include distraction, carrying anti-anxiety medication, staying close to home, and traveling with a familiar companion. Many patients experience panic attacks in cars, especially when they are in unfamiliar places or far from home. A patient once me that her panic symptoms subsided if she turned on her car radio. A few months later another patient told me that her panic symptoms subsided if she turned off her car radio. Safety behaviors are really placebos – they reduce panic symptoms because patients believe that they will reduce panic symptoms. Safety behaviors can reduce the intensity of panic symptoms during a panic attack, but safety behaviors increase the frequency and intensity of future panic attacks. Susan presented with panic attacks and agoraphobia. She avoided driving on crowded roads due to her fear of panic attacks. About two months into treatment she reported that she had been driving and approached a choice point where she could take either of two roads. "One was jammed and moving slowly," she reported, "while the other was almost empty and moving rapidly ... so of course I took the jammed road." When Susan reported this incident, I knew that she understood the treatment and would soon be panic-free. Powers et al. (J. of Consulting and Clinical Psychology, June 2004) found that performing safety behaviors reduced the effectiveness of CBT for claustrophobia by about 50%. In this study one of the safety behaviors was opening a window to let in air. The authors found that telling patients they could open the window to let in fresh air impeded treatment effectiveness even when patients did not open the window. This suggests that both performing a safety behavior and the belief that a patient can perform a safety behavior impede CBT for panic attacks. Panic patients almost always have other psychological problems which increase their level of stress and their susceptibility to panic attacks. For example, panic patients often suffer from an overconcern with what others think of them. And most patients suffer from low self-esteem, unassertiveness, and some conflictual family and interpersonal relationships. Alleviating these psychological problems will lower patients' stress level, increase their satisfaction with life, and reduce any psychological symptoms, including panic attacks. Most panic patients do best when treatment focuses on both their panic attacks and their other psychological problems. We are doing our panic patients a disservice if we treat only their panic attacks and ignore their other psychological problems. So evaluate panic patients' other psychological problems and explain the benefits of treating those problems as well as the patient's panic attacks. If patients are not making satisfactory progress with these techniques, consider and discuss with the patient which of techniques 5 - 9 would be helpful and acceptable. Patients have a tendency to perform homework exercises right before their therapy session. Record-keeping can motivate patients to do their exposure exercises throughout the periods between therapy sessions. Patients who are willing can record their exposures, the frequency and intensity of their panic symptoms, their cognitions, the situations they avoided, and their safety behaviors. This information can be used for treatment planning, and to measure progress during treatment. Record-keeping also focuses patients on the behaviors and cognitions they must change to overcome their panic attacks. Unfortunately many patients are very reluctant to keep records, so be careful to make homework suggestions rather than homework assignments. Otherwise some patients will terminate treatment rather than face you and admit that they didn't do or didn't record their homework. Research has found that record-keeping (often called "self-monitoring") increases compliance with homework suggestions. Now if we could only find a way to increase compliance with record-keeping. Don't just treat panic attacks. Treat all the psychological problems of panic patients. In vivo exposure means facing the real life situations that provoke panic attacks. Interoceptive exposure means creating panic symptoms through physical exercises. In order to reduce patients' fear of their symptoms, ask them to do physical exercises to create panic symptoms during therapy sessions. Patients are more willing to experience panic symptoms in the relative safety of their therapist's office. And once they do interoceptive exposure in your office, they are more likely to do interoceptive and in vivo exposure on their own. To produce racing heart and shortness of breath, run in place. To produce dizziness and nausea, spin around standing up or in a chair that swivels. To create feelings of unreality, tingling, and hot or cold feelings, breathe deeply, forcefully, as if you were trying to blow up a balloon. To produce the feeling of not getting enough air, breathe through a straw. To produce feelings of lightheadedness, place your head between your legs, then sit up quickly. When doing these exercises, patients should focus on their bodily sensations – they should do nothing to distract themselves from their symptoms. Exposure teaches patients that they can tolerate their symptoms and that their worst fears will not occur – they will not have a heart attack, go crazy, or lose control. As with in vivo exposure, interoceptive exposure exercises should be frequent and prolonged. Ask patients to imagine that they are in a panic-provoking situation and experiencing panic symptoms. Ask them to try to create the most intense symptoms they can. Finally, ask them to rate their symptoms on a scale from "0" - "10," where "0" is no symptoms and "10" is the most intense panic they have ever experienced. This rating system can also be used to help you understand the intensity of your patients' symptoms, and also to help you and your patients track their progress in overcoming their panic symptoms. After doing imaginal exposure, patients will be more likely to do in vivo exposure. Imaginal exposure is only helpful if patients can create symptoms imaginally. Imaginal exposure is something of a paradox: being able to create panic symptoms imaginally is a therapeutic experience; while being unable to create symptoms imaginally may mean that the patient is getting better. Sometimes patients' families or friends try to help by reassuring patients that they are ok or by offering suggestions to calm the patient's fears, such as taking deep breaths. During or after a panic attack, significant others sometimes take the patient to an emergency room or to a physician. These well-intentioned efforts interfere with exposure, reinforce patients' fears of their symptoms, and impede treatment. Significant others sometimes have to be educated about the involuntary nature of panic attacks. Berating panic patients or telling them to "grow up and cut out the foolishness" is also counter-therapeutic. Breathing and/or other relaxation exercises may help some patients do their exposure exercises. Or they may reinforce patients' cognitions that their panic attacks are dangerous or intolerable. Patients should not attempt relaxation exercises during a panic attack. Relaxation exercises will not reduce symptoms during a panic attack, and they are likely to frustrate patients and diminish their motivation for treatment. Schmidt et al. (Behaviour Research and Therapy, 2002, pp. 67-73) found that relaxation exercises do not add to the effectiveness of CBT for panic attacks. However, research draws general conclusions about large groups of patients. Relaxation exercises may facilitate treatment for some patients, impede treatment for others, and have no effect on a third group. So we therapists must use our clinical judgment and decide whether to use breathing or other relaxation exercises with each patient who experiences panic attacks. I would suggest using relaxation only after other techniques have not been successful. If patients are still not making satisfactory progress, consider medication as a last resort. 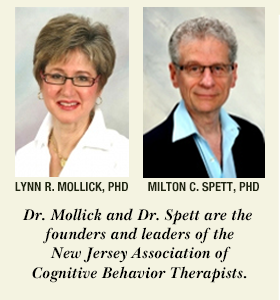 Medications are potentially addictive and tend to impede the effectiveness of CBT for panic. Two studies have found that CBT without medication is more effective for panic than CBT with medication (Barlow et al., J. of the American Medical Association, 2000, 2529-2536; Otto et al., Behavior Therapy, 1996, 473-482). Medication may be counter-productive because it functions as a safety behavior, interferes with exposure, and strengthens patients' dysfunctional cognitions that their panic symptoms are dangerous or intolerable. CBT without medication is more effective than CBT with medication. Although research has found that medication reduces the effectiveness of CBT for most patients, it might be helpful for some patients. Anti-depressant medication can reduce patients' symptoms after a period of weeks or months, possibly enabling patients to do their exposure exercises. As cognitive and behavioral interventions diminish patients' symptoms, medication can be gradually reduced. One study found that for the 20% of patients who did not respond to three months of CBT, switching to Paxil was more effective than providing additional CBT (Craske & Barlow in Barlow, Ed. Clinical Handbook of Psychological Disorders, Guilford, 2008). Clearly there are a few panic patients who do better with anti-depressant medication than with CBT. Most anti-anxiety medications work immediately and may occasionally be necessary to prevent a real life loss, such as the loss of a job. If a real life loss is not imminent, try to persuade panic patients not to use anti-anxiety medications because these medications are more addictive than anti-depressants, and are likely to diminish the effectiveness of CBT. Clinical Vignette – How to Cure Panic Attacks in Ten Minutes. Joseph: "I take the train to my job in New York City every morning, and I get terrible panic attacks. I feel like I can't breathe, my heart is pounding, I am burning up, and I expect to have a heart attack any minute. So I wait for a fairly empty train to arrive, and then I go to the last, least crowded car, turn my back to the other passengers, and stare out the window, trying to pretend that I am not on the train." Therapist: "Once panic attacks begin, the most important cause of panic attacks is the fear of panic attacks. The more you fear panic attacks, the worse the panic attacks become. So you have to overcome your fear of panic attacks. But in reality, there is nothing to be afraid of. Panic attacks can be very uncomfortable, but they are not dangerous and they cannot hurt you unless you let them scare you. "Think of the panic as an external enemy that is trying to control you through fear. It is making you do all these things to avoid your symptoms, but all your efforts aren't really working. If you can show the panic that you aren't afraid of it, it will give up and leave you alone. "Tomorrow morning, show the panic that you aren't afraid of it. Wait on the platform until a really crowded train comes along, then go into the most crowded car, and stand right in the center of that car looking directly at the other people. "Let the panic do its worst, but show the panic that it can't intimidate you. Refuse to do what the panic is trying to make you do. If you show the panic that you can take its worst symptoms without giving in to it, eventually the panic will give up and you'll be symptom-free." When Joseph arrived for his second session I asked him about his homework assignment. "It went fine," he said, "I did what you suggested, I had absolutely no symptoms, and I've been doing it every day with no problem." I tried not to show how surprised I was that the treatment had worked so fast.